Given the harm that the sun’s ultraviolet (UV) rays can do to the eyes, it is essential that adults and children wear proper eye protection while outside – regardless of the season. Sunglasses continue to be the most effective tool for preventing immediate and long-term UV eye damage. The right pair of sunglasses will block UVA and UVB light – as indicated by a sticker or label on the glasses verifying UV protection. Consumers today have several options when it comes to eyewear. Anti-reflective coatings and UV treatments can be added to both sides of prescription lenses for daily protection, and a wide range of prescription sunglasses are available. Non-prescription sunglasses come in a variety of lens and frame options. Different lenses can enhance visual contrast during particular activities, such as driving, golfing, skiing and boating. 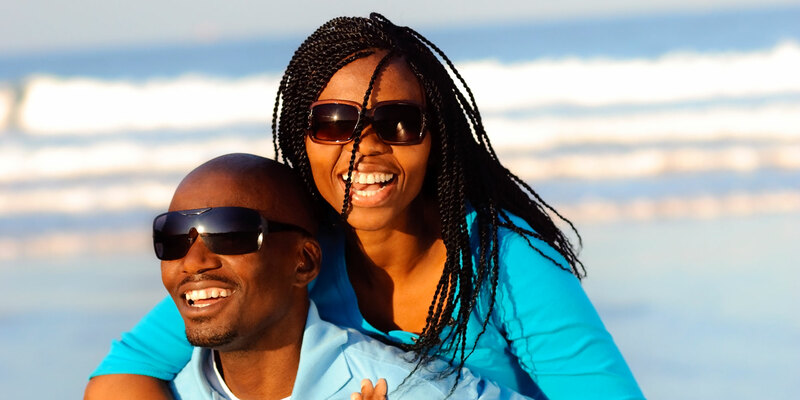 Other eyewear options can help maximize UV protection. Most swim goggles, for instance, have UV coatings that protect against exposure from water-reflected sunlight. Certain brands of contacts may also offer UV protection, though contacts alone are not sufficient. Contacts should be worn in combination with sunglasses to shield all parts of the eye from UV rays. Comfort is Key: Choosing frames that are comfortable to wear for long periods of time is essential when picking out a new pair of sunglasses. It goes without saying that if the sunglasses don’t fit well, they won’t be worn. This is especially true when choosing frames for specific outdoor activities, such as running, skiing, playing outdoor sports, etc., so individuals should talk to their eyecare provider about their sunwear needs to ensure they find the right frames. Square – Choose round, oval or curved frames to soften the face and jaw line. Frame suggestions include: rounded or oval Jackie O-inspired styles, cat-eyes and semi-rimless frames with soft curves. Create a Sunwear Wardrobe: Sunwear is not only a health necessity, but a great fashion accessory. Popping on a pair of sunnies can pull an outfit together in an instant, or turn a go-to ensemble in a completely different look. Having an arsenal of stylish frames to rotate through is a great way to have fun with outfits. Tap into Today’s Trends: Still unsure of where to start looking for the perfect shades? Take a look at the latest runway styles for inspiration. Check out Eyecessorize.com for the latest in eyewear trends, plus more tips and tricks for finding must-have sunglasses.